Located in the heart of the Phoenix metropolitan area. Welcome to Covered Wagon RV Park, located in the heart of the Phoenix metropolitan area. We invite you to explore our website to learn more about our park and contact us if you have any questions or would like to book a stay with us. Our RV park is located conveniently off the Black Canyon Highway (I-17) at the Glendale Ave exit in Phoenix, AZ. This is one of the oldest family owned RV parks in Phoenix, AZ with lots of shady trees and grassy areas. Our RV park has about 52 large sites with full hookups, swimming pool and laundry facilities. 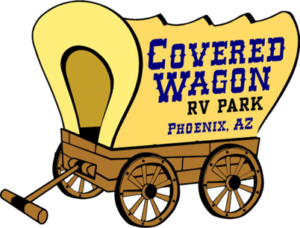 Covered Wagon RV Park has easy access to attractions in Phoenix area including: Shopping Malls, Hospitals, Schools, recreational areas and sports complexes. Our RV park is family owned since the 1980’s and our staff is very flexible and accommodating to your needs. We are eager to hear from you and help you with your plans and make your stay a pleasant one.